Lionhead Studios' Fable empire is built on the innovative notion of how selfless and selfish choices affect storylines, main characters, and bystanders. Moral choices in Fable I are obvious and easy — to kill or not, to steal or not — and rewarded as expected. Exemplified early in its Bowerstone Old Town region, Fable II ups the ante by adding surroundings to the list of things that are affected by moral decisions. Economics also plays a developmental role, as the amount of gold spent at shops and going rates for their goods contribute to the displayed degree of community affluence as well as shopkeepers' perceived purity. 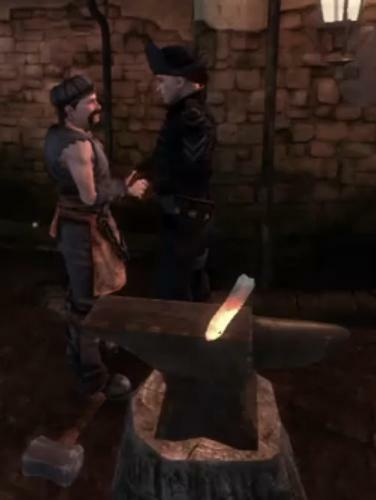 Fable II also makes select moral choices a bit more ambiguous, but they are still pretty clear in terms of consequences. Enhancing all of the above, Fable III tells a story that takes place 50 years after players put down their controllers and shelved Fable II. 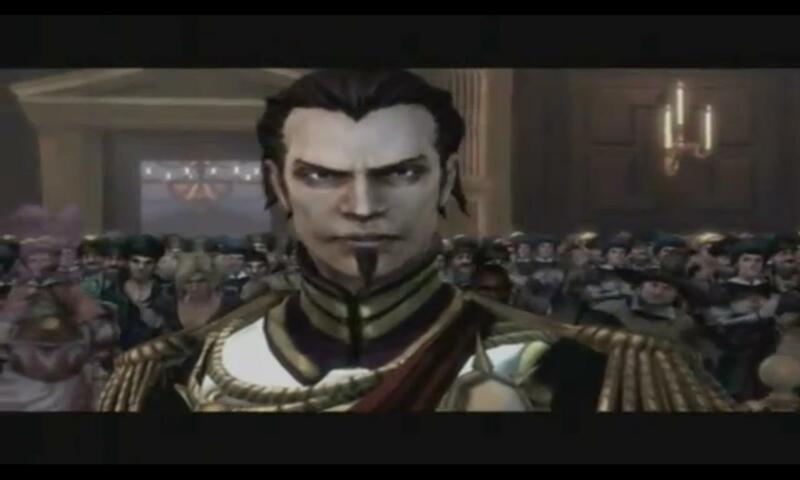 Within this gap, the then hero-turned-monarch gives birth to Fable III's hero, who has a brother crowned king and a servant from Monty Python's Flying Circus. Despite the latter, many call Fable III heavy-handed ... and for good reason. The story is one of revolution and thus focuses on conditions that lead thereto: crippling poverty, exploitation, and abuse of power. 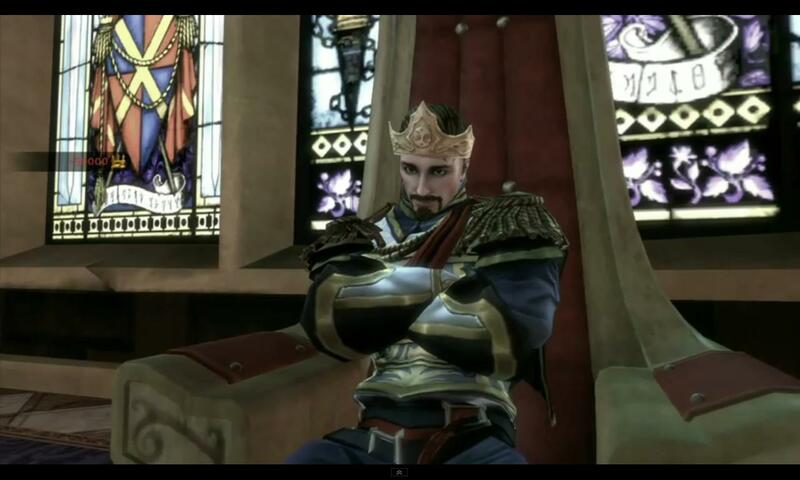 In the eyes of Albion's citizens, the king has grown corrupt. He neglects or exploits the majority of the land's people and allows industry to determine morality. There are but two thriving towns, one of which can be likened to an open-air mall, while the others are either in shambles or on their way there. As if to exemplify this, beggars, while naught but a scant novelty in Fable II, are prevalent in just about every town, very vocal, and heartbreaking. In fact, the very first heroic act players are tasked with performing is simply to engage the disheveled Dwellers of Mistpeak. The heavy-handedness comes into play via the oppressive atmosphere, lent to by an impressive array of one-liners from the downtrodden, their general aesthetic and manners of motion, and the sight of houses falling into disrepair. Thus the hero's first role is that of the people's savior, a goal that must be reached by accumulating public and military support. To this end, Fable III puts forth decision after decision (almost immediately and most definitely substantially) that affects the story's hero, the people that surround him or her, and the places all of Albion's citizens inhabit. After players oust the king, it's their turn to play sovereign and prove that they can do better. It may seem a bit odd that a tale about inspiring then leading a revolution made possible by personal interaction takes place via a video game – a medium which stereotypically attracts one-on-none interaction between those with skin sensitive to natural light and some type of TV or monitor – but it is exactly that medium which can inspire the dichotomy the game is attempting to emulate. 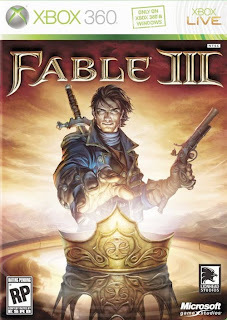 For example: Fable III is solely available on Xbox 360 and PC. On large, those playing the game presumably have the disposable income with which to purchase the disc as well as a computer or game console that supports it. Thus, being self-aware, introspection should result in gamers feeling one of two ways when confronted with depictions of poor people delivering over-the-top expressions of their desperate situation: humor over the absurdity if they cannot feel any guilt or connection, or pangs of sympathy via understanding of the vast difference in social situation. The effects of players' actions on the characters of Fable III and the contrast betwixt them and players' lives aren't the only means of fostering sympathy. Little things, like Demon Doors that require you to work with someone online (friend or stranger), achievements for marrying someone online, and the fact that the online co-op portal facilitates random hero match-ups, fosters the same interaction the game preaches as an instrument of positive change. These sorts of details may not exactly be the same as twirling a random citizen about in a two-step or clucking to evoke the laughter of children, but it is coerced interaction (mandatory, even, if the solo player chooses to try and complete 100% of the game). Of course there are also subtle detractions from the effectiveness of having to interact with villagers. I'm not generally a people person to begin with, so the amount of yokel persuasion required by Fable I & II worked just fine for me. Fable III however, makes you pay attention. Whether the intent is to greedily acquire more guild seals or earn trust to further a quest, constantly shaking hands, dancing, and playing pat-a-cake gets tiresome and downright burdensome despite the efforts of programmers, writers, and voice actors, who do their best to bring a decent amount of diversity to reactions to such interaction. 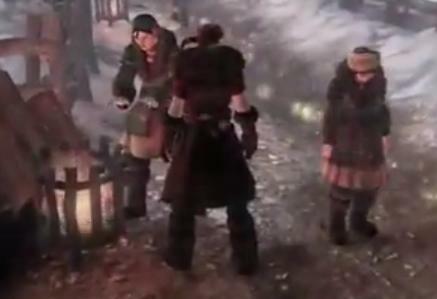 However, interactivity isn't the only impressive thing about Fable III. A simplified inventory and more streamlined gameplay greatly improve the overall experience. Early on, the most noticeable improvement is with the quick d-pad selection during fights. No longer are the suggested health items and potions randomized; players, when engaged in a fight, are offered 3 types of potions, two of which were formally Will capabilities (Slow Time and Raise Dead), and one food option. Also, there is no more random food or drink, as players can only carry around one type. Similarly helpful, all experience orbs are now automatically collected during a fight instead of requiring players to hold down a button at the end while losing some of them due to evaporative time. Regarding actual battle, the range of enemies keeps the action on the interesting side of almost challenging (if only a tad redundant). There's a decent diversity among the malicious, with each class usually comprised of three types: brute, ranged, and "special." Examples of the latter include twin-bladed, will (shock)-using hollowmen; fireball-tossing mercenaries; and necromancing hobbes. 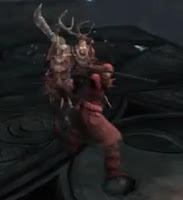 Combat is fluid and pretty mindless, which can be excused due to the focus of the game being on personal interaction instead of hack-and-slash/shoot/burn action. Still, weapon diversity and morphing capabilities, along with the range of Will types and COMBINATIONS, make even the most repetitious battle fun. Personally, I like creating tornadoes of fire that sweep up and twirl the enemy around me as I shoot them with my rifle. No mercy. The only real drawback to the action aspect of gameplay is blocking. As a Will- and Skill-heavy user, I don't rely on blocking much, but whenever I held the X button (also used for flourishes), the enemy's attack seemed to get right through anyway. Would mapping the block action to a separate button really have been that hard? The last thing that deserves mention is the start menu. 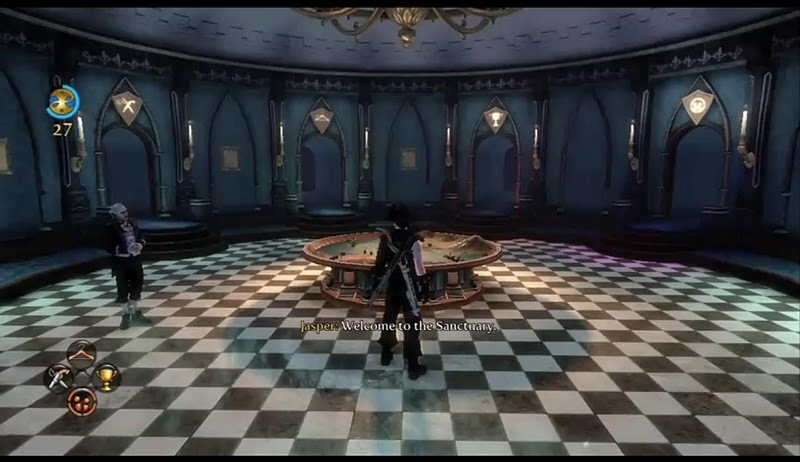 Personified as "The Sanctuary," this ever-evolving hub connecting a series of four rooms is said to have served as the secret base of operations for the Fable II hero during those 50 years between Fables II and III. The current hero uses it likewise for changing outfits, outfitting weapons, basic accounting (you heard me), and viewing trophies. It also offers a portal to online co-op and an in-game, romanticized Xbox Live Marketplace. Aside from the specialty rooms, The Sanctuary offers an interactive map of Albion that integrates fast travel and quest identification capabilities. The only issue I had with it was the lack of detail. Otherwise, the map was an inventive addition that blended in perfectly with the atmosphere. Some players might find the theme heavy-handed or dislike the repetition involved with the garnering of support, and RPG fanatics might dislike the fact that there aren't 50,000 potion and food choices. 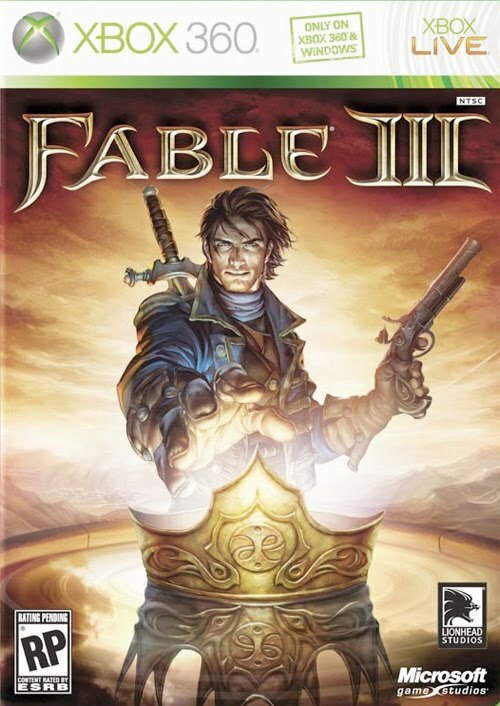 However, Fable III's compelling story line with two-part plot, exhilarating climaxes, and myriad options for replay make this game an astounding and well thought out addition to the series that actually manages to carry over its effects into the real world. More than a few moments made me get choked up, and every gameplay session was so absorbing that none lasted fewer than a couple hours. Monthly Snapshot: Choose what? I just woke up!